After the 1996 season, the Houston Oilers announced they would be moving to Nashville for 1997. The Oilers’ new stadium would not be ready until 1999, however, and the largest stadium in Nashville at the time, Vanderbilt Stadium on the campus of Vanderbilt University, seated only 41,000 too small even for temporary use. Vanderbilt was also unwilling to allow for alcohol sales. 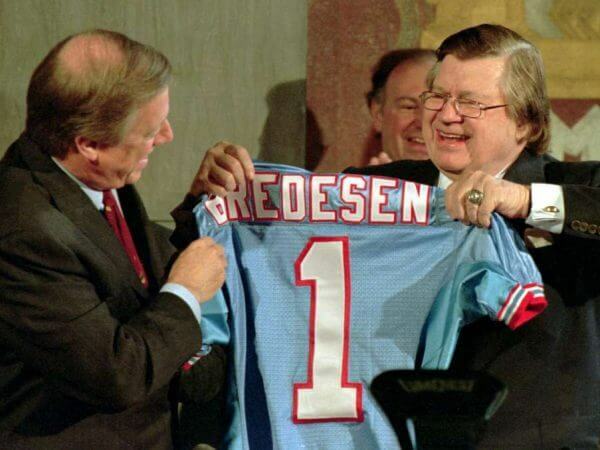 At first, owner Bud Adams rejected Vanderbilt Stadium even as a temporary facility and announced that the renamed Tennessee Oilers would play the next two seasons at Liberty Bowl Memorial Stadium in Memphis. The team would be based in Nashville, commuting to Memphis only for games—essentially sentencing the Oilers to 32 road games for the next two years. The University of Tennessee’s Neyland Stadium, in Knoxville, was slightly closer to Nashville. However, Adams rejected it because at 102,000 seats, it would have been all but impossible to sell out. After fan support in Houston collapsed for the 1996 season, the Oilers announced they would be moving to Tennessee for 1997. The Oilers' new stadium would not be ready until 1999, however, and the largest stadium in Nashville at the time, Vanderbilt Stadium on the campus of Vanderbilt University, seated only 41,000 — a capacity deemed too small for even temporary use. Oilers - Originally located in Houston and relocated to Tennessee in 1997. Named for the Oil industry for sentimental and social reasons, in that it is the largest part of the economy and workforce in Texas, as many cities were found on oil. Who is the greatest Tennessee Oilers? Originally located in Houston and relocated to Tennessee in 1997.